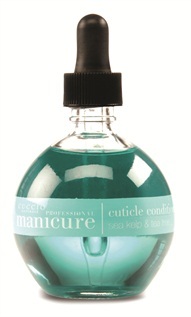 Cuccio Naturale’s manicure oils, available in three scents, help condition, nourish, and revitalize your clients’ cuticles. Milk & Honey contains lactic acid from milk and natural honey, which adds additional moisture and hydration. Sea Kelp & Tea Tree is an antiseptic softener. And Pomegranate & Fig contains antioxidants and vitamin E for a refreshing experience. A decorative image printed on special paper for transfer to another surface; often used in nail art.